Edward Deming, considered to be a “God” in the eyes of the Japanese business community for his influence on their manufacturing sector after WWII is attributed as the source of the now somewhat obvious quote above. His philosophy was one that wanted us to see manufacturing as a “system,” not a series of bits and pieces of additive work. The idea was that by applying appropriate principles of management consistently, quality could be increased AND costs reduced by reducing waste, improving customer satisfaction, less staff churn, and less litigation. His philosophy remained relatively unknown in the US until the 1980’s, when it became clear that Japanese manufacturers - who took this approach to heart in the 1950’s – were going to be succeeding at bumping the US off its perch in many key industries due their superior quality and cost management techniques, including the “just-in-time” manufacturing that the Japanese auto industry made into a household term. (a) When people and organizations focus primarily on quality, defined by the following ratio, quality tends to increase, and costs fall over time. 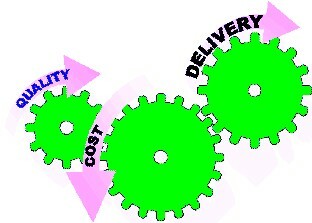 (b) However, when people and organizations focus primarily on costs, costs tend to rise, and quality declines over time. One might even say this is a modern version of the Ben Franklin wisdom of being “penny-wise, pound foolish” applied to manufacturing. The key takeaway here is that a focus on quality is NOT a path to higher cost, but rather that the path to lower costs is a healthy obsession with quality. In the last 20-30 years, there have been many “systems” created and rolled out that were supposed to be the final word in quality. Undoubtedly, there will be more coming our way in the following decades as well. For today, we’ll take a brief look at the four major success stories in the evolution of quality. Total Quality Management (TQM). TQM is an entire management system focused on people their focus on increasing customer satisfaction while continually reducing costs. It uses scientific methods for assessing quality, its associated costs and constraints to implementing improvement. TQM also requires a total systems approach where all functions, processes, and departments, and all employees at all levels, are integral to ensuring success – be it in manufacturing or delivery of services. Learning and adaptation to continual change are essential for achieving success. Six Sigma. Coined by Motorola as its methodology for improving business processes by minimizing defects, Six Sigma refers to a statistical measurement of “only 3.4 defects per 1 million opportunities.” To produce a defect (or virtually zero). As an organizational approach, it means that companies make decisions based on data, seek roots of problems, define defects based on customer requirements, and track leading indicators of problems to prevent them from happening. Lean Production. 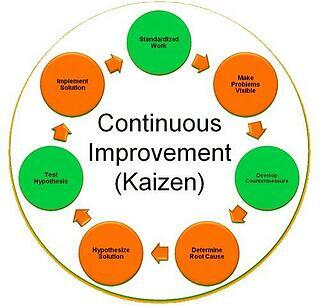 Lean production, which can be credited to the Japanese adoption of Deming’s teachings, refers to the continuous flow of products or services to the customer at the moment it is needed and to the customer’s specifications. It focuses on increasing productivity and quality while reducing inventory and shortening lead time from floor to customer. Its principles include workplace safety, order, and cleanliness; just-in-time production; built-in Six Sigma quality; empowered teams; visual management to track performance and provide immediate feedback on a daily or even hourly basis; and continual pursuit of perfection. International Standards Organization Quality Management Standards. The International Standards Organization (ISO) has developed a series of quality management standards that support the quality philosophy. Specifically, it has developed a set of five such standards, ISO 9000–9004. The American National Standards Institute (ANSI) and the American Society for Quality Control (ASQC) developed the ANSI/ASQC Q9000–Q9004. Also, specific standards also exist for automotive, aerospace, and telecommunications industries and environment management. These standards have been revised over the years, and organizations must continually address these revisions. Organizations competing in the global market must achieve the quality levels dictated by these standards. The importance of quality both as a means of ensuring customer satisfaction and reducing cost has become increasingly recognized over the past thirty years. The philosophy has shifted from Quality Control to Quality Assurance to Zero Defects and beyond, while standards such as ISO 9000 have sought to level on the practice. Total Quality, in fact, means that quality is all pervasive through a company’s products, processes, procedures and systems and thinking - and is practiced by all. Consider a manufacturing process. There are some ways it may endeavor to ensure the customer gets what he/she wants. 1. The process can make a good product but is unreliable, and defects escape into the market. If customers complain, their complaints are resolved. This is costly and may harm reputation. 2. Inspectors detect bad product at the end of the process and repair/reject it to protect the customers. This is costly and frustrating; deliveries will be delayed or costly buffers of finished goods required. 3. Defects are returned to source for rectification or rework. Costs remain, as in (2). There are delays in identifying problems so causes may not be apparent. 4. Defects are detected at the source; causes will be more obvious. Delivery remains erratic, downstream customers are kept waiting, but at least they're not adding value to the defective product. 5. Defects are prevented. 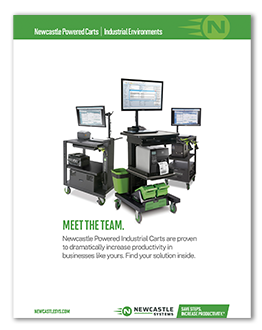 Through improving products and processes, we can assure delivery without incurring rectification costs. The customer knows what they want. We have to ask the right questions to define the specification. Market research may involve anticipating consumer needs; we need feedback from customers. We need data. We need materials and equipment capable of achieving what is expected, and products designed not only for the market but for manufacture. We rely on those responsible for Design, Engineering, and Sourcing to provide what is required. We have to accept responsibility for our own actions. People need to be trained, directed and motivated. We look to Personnel and Training for their support. We are all part of a team which is the Business; a team which is our particular Division or Department; and a team which consists of those with whom we work on a day-to-day basis. We can take pride in what we collectively achieve for our customers and shareholders, and satisfaction in playing our part as individuals. TQM primarily addresses the business as a whole, developing a state of mind consistent with the above. 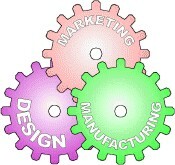 Three major divisions of a manufacturing company may be considered as illustrated left. 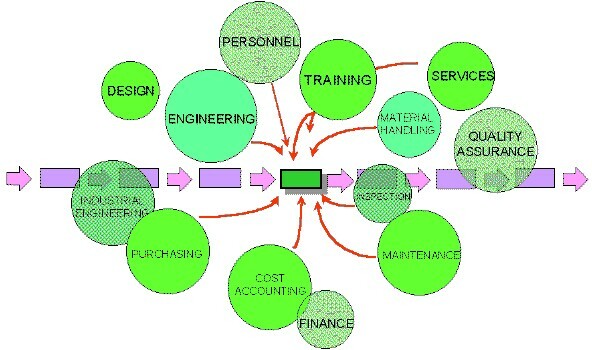 Six Sigma is a similar approach which uses the same tools and techniques, ' re-labeling' some and according to the title 'Black Belts', etc. to the facilitators. It's simple (but not easy!) goal is to achieve six sigma capabilities of all business processes - a 3.4 ppb defect rate. Did you know the average US warehouse worker wastes about 6.9 weeks a year with unnecessary motion? Or that Wasted Motion costs US warehouses about $4.3B per year or 265 million hours in labor? To perform your on site assessment, download our new MotionMeter app.